Heat the oven to 350°F. Grease 9-inch spring form pan with shortening or spray with cooking spray. Place 6 cookies in freezer. With fingers, press remaining cookies in bottom of pan. Set aside while making filling. In large bowl of electric mixer with paddle attachment, beat cream cheese and sugar on low speed until creamy and fluffy. Add eggs one at a time, beating and scraping sides of bowl after each addition. Add whipping cream and sour cream; beat just until combined. Pour filling over cookie crust. Remove 6 cookies from freezer. Crumble frozen cookies over filling. Bake 1 hour to 1 hour 5 minutes. Turn oven off and slightly open door; let cheesecake cool in warm oven 2 to 3 hours. Remove cheesecake from oven. Run butter knife gently around side of pan. Refrigerate cheesecake 1 hour. Remove side of pan. Cut into slices to serve. It's very important both the cream cheese and the eggs to be at room temperature. This ensures the batter will be smooth, with no cream cheese lumps. If desired, sprinkle 1/4 cup miniature semisweet chocolate chips over the filling before baking. 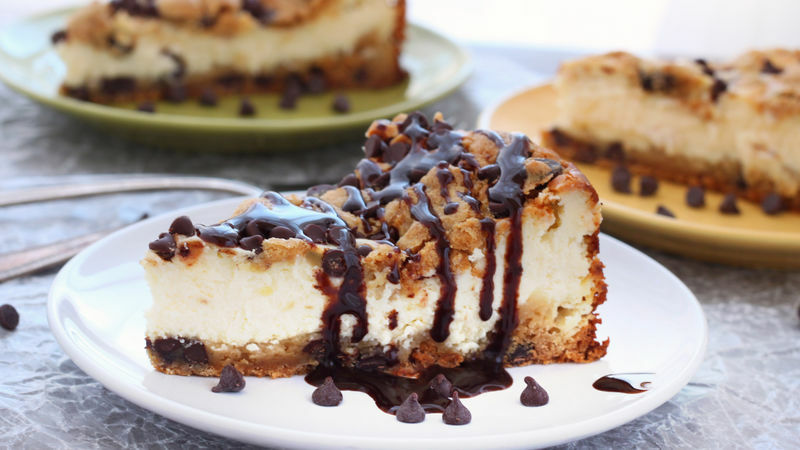 Then serve the cheesecake slices drizzled with chocolate syrup. Do not rush the cooling time by removing the cheesecake from the oven. Doing so will result in deep cracks in your cheesecake.